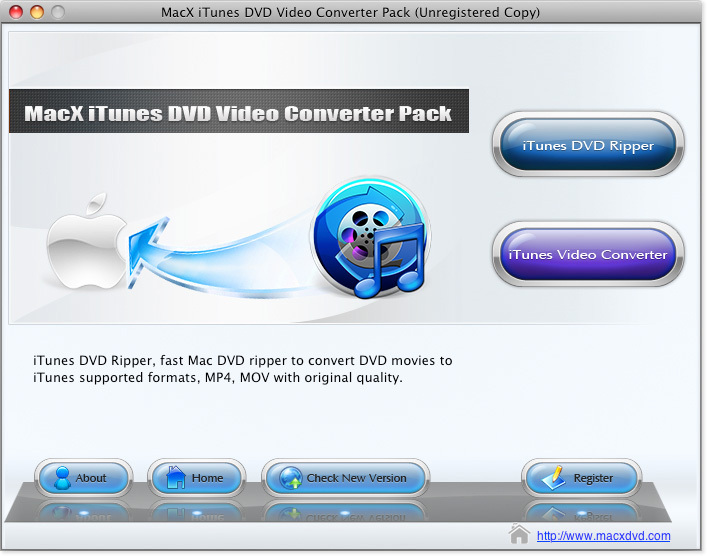 MacX iTunes DVD Video Converter Pack for Mac bundled with two iTunes software: MacX iTunes DVD Ripper for Mac and MacX iTunes Video Converter for Mac. It is dedicated to convert video from DVD movies to iTunes, MP4, MOV on Mac OS X, as well as provides a perfect solution to convert iTunes video from all mainstream video (HD video), such as MKV, M2TS, AVCHD, AVI, MPEG, FLV, F4V, RM, RMVB, WebM, Google TV, etc. Rip DVD and convert video to iTunes, MP4, MOV on Mac OS X. ...... iTunes - As a professional DVD to iTunes software, MacX iTunes DVD Ripper assists you to rip any DVD to iTunes supported format which is high compatible with iPhone, iPad, iPod and Apple TV. * Both HD and SD Video Input Supporting - Using MacX iTunes Video Converter, you are able to convert the mainstream video to iTunes to format MP4, H.264 (.MP4) for import into iPhone, iPad, iPod and Apple TV. * Convert DVD Movie/Video to MP4 MOV - Besides iTunes output format, MacX iTunes DVD Ripper also supports converting DVD to MP4, H.264, MOV etc. MacX iTunes Video Converter features converting video to MP4, H.264, MOV even YouTube FLV format. * Multi-Track Videos Supported - It is a perk for users to convert multilingual video (BDAV, M2TS, MKV, AVCHD, MPEG-TS etc) to specific video formats with their preferred language. * Grab Pictures and Extract Audio from DVD/ Video. * Trim Clips from DVD/Video. * Flexible Parameter Setting for Advanced Users. Qweas is providing links to MacX iTunes DVD Video Converter Pack for Mac 3.4.0 as a courtesy, and makes no representations regarding MacX iTunes DVD Video Converter Pack for Mac or any other applications or any information related thereto. Any questions, complaints or claims regarding this application MacX iTunes DVD Video Converter Pack for Mac 3.4.0 must be directed to the appropriate software vendor. You may click the publisher link of MacX iTunes DVD Video Converter Pack for Mac on the top of this page to get more details about the vendor.